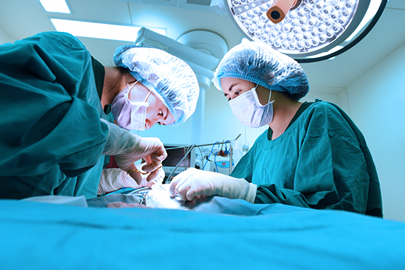 Your injured employee may be coasting along with fairly predictable claims costs and suddenly something happens and they need surgery. HomeCare Connects delivers the right medical equipment and supplies just when the injured worker needs them. HomeCare Connect is clinically driven, which means we know how to deliver the right care at the right time from the right providers. Not all contractors can modify homes to accommodate injured employees. HomeCare Connect takes the pain out of your home modifications. Few injuries are more traumatic than amputations. We offer special care from experienced and empathetic orthotic and prosthetic providers. Your injured employee may be coasting along with fairly predictable claims costs and suddenly something happens and they need surgery. If there are complications, costs can skyrocket. HomeCare Connect knows the cost drivers in catastrophic and complex claims and how to mitigate them. First, we hand-pick providers with expertise in treating catastrophic cases. Second, each complex claim is assigned to one of our Clinical Care Coordinators (CCCs), who have a minimum of an RN degree and usually advanced credentials in catastrophic case management and extensive workers’ compensation experience. CCCs oversee in-home assessments and evaluations, closely monitor lab work and changes in physical condition and anticipate age- and injury-related situations to avoid costly — and often unnecessary — hospitalizations, surgeries or other expensive treatment. CCCs also hold regular roundtable discussions with our Medical Director and the Director of Clinical Services to ensure that all injured employees consistently receive the best possible care. And, they stay connected with the injured worker, physician, adjuster and/or nurse case manager and other stakeholders on the claim to avoid unpleasant surprises. Costs Savings Reports, delivered on the client’s schedule, keep claims on track financially and help capture savings. Additional and very significant savings can be found in our exclusive re-pricing program. HomeCare Connects delivers the right medical equipment and supplies just when the injured employee needs them. Home assessments ensure the best equipment is ordered and fittings ensure the injured workers know how it should feel and how to use it. A poorly fitting wheelchair can literally rub a person the wrong way and cause hard-to-heal wounds, prompting the need for more treatment and cost. We have forged relationships with the most reliable and responsive equipment manufacturers and medical supply companies in the industry. Whether it’s an electric wheelchair, a bone growth stimulator or a hospital bed, we will equip your injured employee with the most appropriate and most cost-effective DME and medical supplies. HomeCare Connect is clinically driven, which means we know how to deliver the right care at the right time from the right providers. Our 17,000+ provider network has every level of caregiver in the industry, from sitters/companions and or CAT-qualified RNs. Whether the injured worker needs IV antibiotics or in-home physical therapy, we have you covered. standards and their insurance coverage is up to date. We contract with providers directly, setting clear expectations about the timing and delivery of care, and we confirm that all services are rendered appropriately. HomeCare Connect ensures that your home modifications are done right the first time and that they meet the needs of your injured employee. Our modification specialists ensure that any recommended modifications are needed and appropriate. We conduct an on-site visit to the home, taking measurements and photos. A detailed quote explains what needs to be done, estimates costs and explains how changes will address functional status, medical condition, accessibility barriers, and other requirements. Work is completed by one of the licensed, ADA-certified and credentialed contractors in our national network. We oversee the contractor, manage the project and provide weekly updates through the project’s completion. Modifications are completed on time and within the budget, and the final report recaps how the modifications met your injured employee’s needs. And now with TeleConnect, you can have 100% transparency into the project. Our cloud-based app enables HIPAA-compliant video conferencing among claims representatives, contractors, clinicians, occupational therapists, nurse case managers, and anyone else involved in your project -- regardless of their location. You can tour the home virtually, ask questions and get answers right away. Real-time resolutions expedite decisions and accelerate home mod completions – which can translate into significant savings. Watch the video to see how it works and call (855) 223-2228 or email info@homecareconnect.com to request the free service. Few injuries are more traumatic than amputations. These seriously injured employees need special care from experienced and empathetic orthotic and prosthetic (O&P) providers. The O&P providers in our national network understand workers’ compensation. They recognize the need for speed and schedule clinical assessments as soon as possible after surgery. Our O&P experts determine the best prosthetic for the condition, educate the injured person on its use, and work with physical therapists and other providers to help the patient heal and adapt. Dedicated Clinical Care Coordinators help injured employees and payers navigate the process. Amputations and subsequent prosthetic services and devices are the most expensive injuries in workers’ compensation. 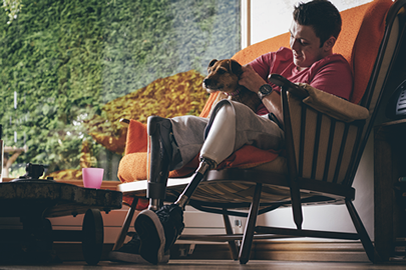 Our care-driven approach ensures that injured employee receive the right prosthetic device and care in the most cost-effective manner. Our bill review specialists realize the importance of preparing quotes that can be authorized easily by claims managers who do not deal with amputations on a daily basis. Our specialized reviewers know the manufacturers, understand the thousands of unique prosthetic billing codes, and can negotiate the best prices. Clients enjoy an average savings of 16% on prosthetics. Injured employees receive prompt and expert care.